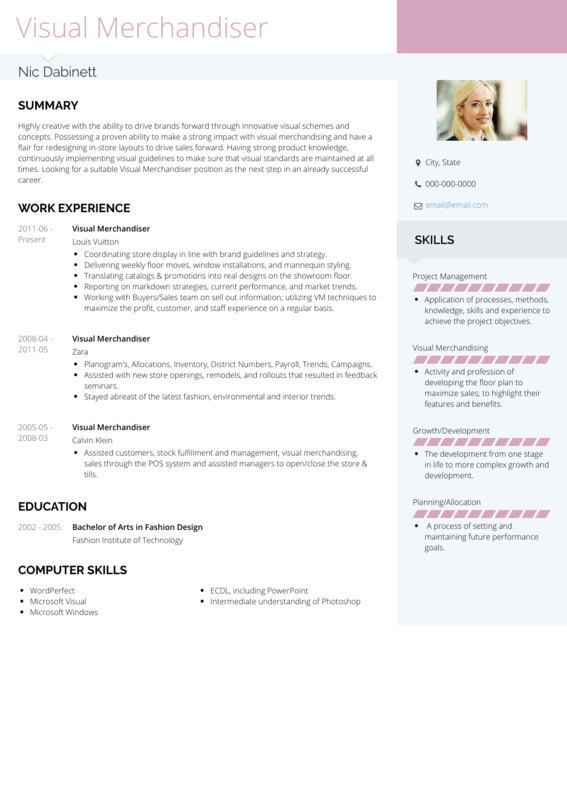 This page provides you with Visual Merchandiser resume samples that you can use for inspiration in writing your own resume, or for creating one through our easy-to-use resume builder. Below you'll find our how-to section that will guide you through each section of a Visual merchandiser resume. Visual merchandising is all about being creative and strategic, and it’s exactly the same when it comes to building the perfect visual merchandising resume. Whilst budgets for advertising and promotional campaigns are always increasing, so is the competition: great landscaping, decor, color and texture skills won’t get you too far without a standout resume. We have inspired many like you with our visual merchandising resume samples: let us help you get the job you always dreamt of. Research shows that art directors will look at a resume for an average of 6 seconds before deciding what to do with it. Not long, is it? You’ve got to highlight key areas fast and efficiently, using your creative prowess to entice them into reading on. We strongly recommend a reverse-chronological format to highlight your strongest achievements straight away. Use clear, easy-to-read font, big headings and plenty of white space: treat your visual merchandising resume layout like one of the display designs you’ve created. Export your visual merchandising resume in PDF rather than word to ensure that it looks clean when being viewed by recruiters. This is your time to sell yourself - a chance to make eyebrow-raising pronouncements combined with hard-hitting stats that show off your biggest wins. Dynamic and professional Visual Merchandiser with 10+ experience in increasing system-wide sales. Developed and led key in-store promotional campaigns across a range of fields. Increased system generated sales and walk-in rate of Spike Lee store by 80% last financial year. Visual Merchandiser with lots of years of experience. Have worked on promotional campaigns and increased sales by researching consumer behavior. With our resume builder you will get tips and examples to inspire you to build the best visual merchandising resume. You should use this section as an objective statement if you’re a junior visual merchandiser: it will give recruiters the best sense of your motivation and desire to further your professional practice. Creative, driven and passionate Visual Merchandiser Graduate seeks in-house position with Spike Lee department store. Competent with MS Word and Coral Draw, have 4 years experience in retail sales and relish working outside comfort zones. New Visual Merchandiser wants job with Spike Lee. Lots of experience selling clothes, can use Word. This is your moment to make your visual merchandising work history fit the job role. No matter if you’ve got years of experience developing developing pricing and tag concepts, or are just starting out in part-time window arrangements, we can make this section shine. Have you single-handedly been responsible for improving a business’s walk-in rate by 150%? Do you roll out visual strategies across a range of outlets, auditing on implementation and inventory policies? Make that count! Don’t overload this section, but do use it to showcase your achievements and your duties. Start with the company name, your position and then the dates you worked. Visual Merchandiser Resume with no experience: We recommend you take on some voluntary experience in the visual merchandising field to help build your portfolio. It could be anything from a small visual branding job for a friend’s business, or a part-time role in the sales field. Check out our detailed resume guide for more information on how to write your visual merchandising work experience. Experience counts for a lot in the visual merchandising field, but having a sound educational backbone is integral as well. Be sure to include any training programs you’ve been on, or any award certificates you’ve been given - but make sure they match the job description. Specialisms in areas like window dressing or display arrangement are really advantageous in visual merchandising and can help you stand out from the pack. All the information listed here must be truthful. If you’ve got a gap in your education or work history, let your recruiter know. The same goes for lack of experience - don’t be afraid to say you haven’t graduated yet, or are making a complete career change. Highlighting your technical and soft skills can give recruiters or art directors that extra push in considering you for the role. They form the backbone of the job description, and allow you to show off the technical acquisitions you’ve made over the years. Cover letter: Yes or no? Follow our simple tips here to write the perfect visual merchandising cover letter. Doing one may help attract potential recruiters to your resume! If you’d like to get some more inspiration, you should check out our visual merchandising resume templates. Professionals like yourself have been using it to transform their careers!